As of 2016-JUN-05 cannot tell where this item is. Nothing within blue "clue circle" on minimap. Blue circle on the map did not point me to him but I ran around the area. You'll find Herbalist Tharillon at 34 / 23 . Kill him and loot the chest behind him to get the quest item. The right position for Herbalist Tharillion is on the southernmost terrace of Moonguard Stronghold as in the screenshot. Pull Tharillon back behind the tree into the little dirt area by the cliff to avoid pulling the pack of mobs next to him. Killed Herbalist Tharillon multiple times and I can see the chest he leave behind. I can't loot it though it's non interactable. Anyone else got the same issue? I dunno, while I can kill him, it takes a bit as he's over 3mil hp. Got as far away as I could, out on the rocks, but no matter what I do, hitting him ALWAYS brings 5-6 mobs on top if me and I simply can't deal with all of them at the same time. The mob pack does NOT seem to path away so I can just kill him just him. After many corpse runs, I finally got a chance when he and only 2 mobs got pulled, barely had any health left but managed to kill them and loot the chest (had to use invis). The building you have to go through to get to him has about 20+ mobs in it, it was a series of run, get killed, corpse run back, rez closer to him, rinse and repeat. Nasty quest. The pile of herbs you need to press to summon him is in a cave located at 55.25 (little west of the map indication). The 34.23 coords are correct; however, you must finish the questline in Moon Guard in order for the herbalist NPC to show up. How do you even navigate this place? Absolutely swamped with packs of mobs. Edit: Getting the World Quest made this do-able. It gives you an ability that places a trap on the ground which deals around 900k damage to all mobs in combat with you. Otherwise you need to be in a party or something with the density of mobs in this area. Just completed this q on my herbalist pally, 14th september. 1. You do NOT need to have done Moonguard quest. My pally hasn't done it, and was able to loot item. 2. The item is NOT dropped by quest mob. 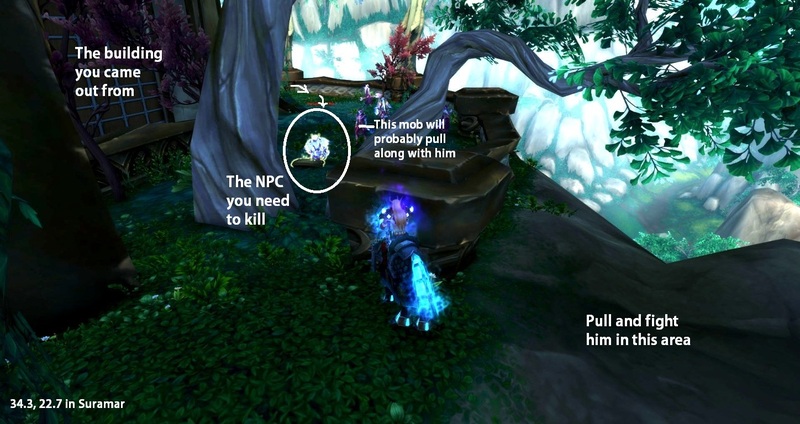 It's looted from a chest near the mob - so if you can CC it, you don't have to kill the npc. 3. NPC drops nothing on death - he just vanishes with some smirky remarks. Closest entry point is from the southeast at about 39, 24 before going on to 34, 23. I used an invisibility pot to tuck myself into the corner right between the back of a bookshelf and a tree. He still aggro'd a bunch of mobs. Definitely worth bringing a bodyguard at minimum. Maybe important to note .. he scales with level. My herbalist was lvl 104 and so was he with 'only' 1709hp. Biggest problem was ofc that you always pull at least that one lvl 110 Nightborn Invader, the one that walks up to him now and then. My solution was not an elegant one. Logged my 110 hunter, cleared the area including Herbalist Tharillon. Re-logged my herbalist and i was able to loot the stash. I am sure players more skilled then i am can 'solo' him at lower levels. As long as you interrupt his Energy Drain i think you can survive him and one lvl 110. Managed to do this as a 103 night elf DK. Ran past everyone, died at the round building to the left when you enter moon guard stronghold from the stairs at the bridge. Advice for low levels who are trying to get in on the crazy Starlight Herb economy. I had to corpse run to get there on a druid (don't even bother stealthing, they see right through it). It took ~4 deaths to get there. Once there, run past everybody out to a ledge on the other side of him. He's level 100, but his guards are 110. I was never able to pull him without pulling 1 110 mob with him. It really helps to be a healing spec, probably mandatory at level 101. I spammed entangling roots on the 110 until it hit, then stepped away and DPS'd the quest mob. The root break early because the mob is so high level, so it might take a few rounds of CC to kill the mob. In between, I was spamming heals on myself and using defensive cooldowns. The 110 doesn't hit as hard as other 110's in the area (e.g. the bears), but you still can't just ignore it beating on you. You never kill the quest mob, he'll walk away and a chest where he was standing will be lootable. Either CC the 110 again or Shadowmeld (night elves ftw), go back to loot the chest. Be quick, when I did it, it aggro'd 5+ 110 mobs. Then run for your life, goblin glider off the edge for easy escape. Many great posts here. I finally managed this as a solo fire mage and thought I would let folks know how. The area behind the tree is big and once you get him over there you can deal with him. He was a moderate kill for me (I'm not great). The problem of course is his freakin adds. BTW. I died a half dozen time trying other strats and almost quit. I tried sheeping him and letting him come for me after popping. He didn't. This way was the only one that worked without bringing 2 adds, and it's all in the timing with the patrol and the nosy fella. Good luck. Another BTW. After you kill him, move up to the tree and open the box without getting in range of the others. Again, you have to time against mister nosy. Everything located in Suramar has to be utterly annoying. In answer to your question, you need a Jeweled Spade Handle drop to start this chain. Keep picking Starlight Roses until you get one. You must FIRST pick Starlight Roses within Suramar until you recieve the "Jeweled Spade Handle". Take this item back to the herbalism trainer in Dalaran then you will recieve a follow up quest to go kill Herbalist Therallion in the Moon Guard Stronghold. Shadow Priest method. Go to the green grassy area behind Herbalist Tharillon at 34 / 23. Drop a Mind Bomb on him and the mobs close to him. Run in and loot the spade, then levitate away over the cliff. The NPC you need to kill (Herbalist Tharillon) is located up on a cliff, in an area with many level 110 Nightfallen mobs. You will need to kill him and then loot a chest nearby to complete this quest. (Note: technically, it's just the chest you need; if you can get the chest without killing him first, that would work too; I did it by killing him, personally. Edit: I am not sure if it is still possible to loot the chest without killing him; judging by posts on this page it seems the opinions about this are mixed). Here is an image showing him and the area around him, and a zoomed out image to give a better perspective of his location here. If you would like to see screenshots showing how to reach his location on the cliff beginning at 26, 27 in Suramar, I have put up several images showing this here, including directions and coordinates for each image. 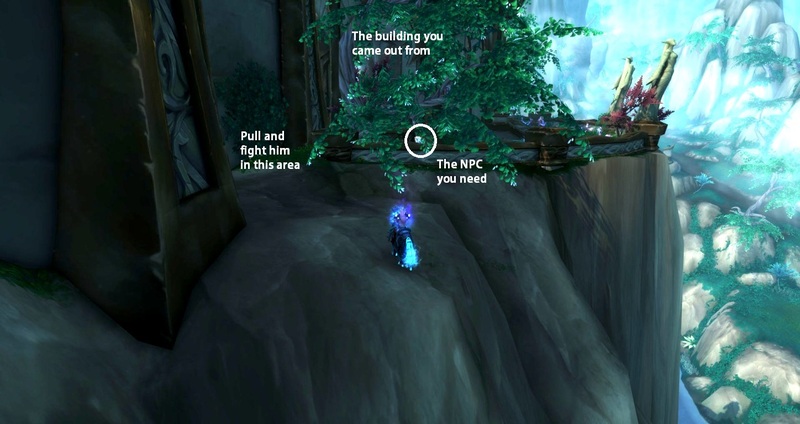 (Note: this post was originally created before flying was possible in Legion, and shows how to get to Tharillon without flying). If you'd rather skip the screenshots, then start at the coordinates indicated above and continue up the path toward the buildings; keep heading up the stairs higher and higher. Note that there will be many level 110 Nightfallen mobs along the way; eventually you will reach an area where you can head right and then down a short flight of stairs, into a grassy yard. Cross the yard to get to a building, which will have a large back exit. Go through the exit and to the right, and you will reach the NPC you need. For the part with the yard and the building, there were so many mobs that I used an invisibility potion to bypass them and ran to the area in which I took the screenshot at the top of this post (this one). Alternatively you could die near the NPC and then res at the area where I am (~34.4, 22.7 in Suramar). As very helpfully noted by Beriberi above, if you pull Tharillon into the place where I'm standing on the cliff, most likely only one other mob will pull along with him and you won't be overwhelmed by mobs. Please note that I was level 110 when I did this; I read on here that, for some people, even when they pulled him from the place shown above, a lot of level 110 mobs still aggroed instead of just one additional one. I don't know for sure, but I wonder if this may be level-related; that is, maybe if you're lower level then due to your larger aggro radius you might pull more mobs even from the 'hidden' area. (Yes, there are people who have noted in the comments here that they've done this quest at levels below 110). It was not a particularly challenging fight for me at level 110, while I read on here that it can be quite a hassle if you're relatively low level. I did it easily by gliding down from Obsidian overlook onto the cupola above him. Then I just dropped down behind him and pulled him into the the empty area behind him. Get the rocfeather skyhorn kite if you don't have it already. I am standing where the I've found out he should spawn, but he never does. Is there something I have to do or is it bugged? I did this as a night elf holy priest without killing anything. I Shadowmelded my way to his location (takes a bit of time, had to wait 2 min for the racial to come off CD, but I pretty much ran and pulled everything from the Moonguard Stronghold portal all the way down.) Shadowmeld behind the chest, away from the nightborne mobs. Then I just Chastised him while I looted the chest, ran away to the safe ledge and Shadowmelded again. Teleported back to Dalaran unscathed. Any night elf class with a quick stun or CC can do the same thing. I just want to state that the method of stunning the mobs and looting the box didn't work for me. When I tried to loot the box while the mobs were stunned, it said the box was locked. After I killed the herbalist, the box was unlocked and I was able to loot. You can also go across the bridge, jump left to the ledge and kill the mobs there. You can jump from ledge to ledge to get to where he is. It cuts down alot on the mobs that you have to kill. I had a friend come help me do this on my 103 Priest. If you are not able to see the NPC then make sure to finish the quest chain - O Destino de Tece-estrelas as it causes a phasing issue. I just did this on a 110 fire mage who isn't all that tough. The best method seems to be go to Obsidian Overlook flight path and use a goblin glider or Skyhorn Kite (don't use slow fall, you can't really control the direction with it). Get the quest selected on your map. Point to it and jump, use the glider, then glide back and forth. You will get above the building there. He is behind it at the right hand side of the grassy area if you are looking toward Suramar. Drop down either on the roof and jump, or glide into the doorway of the building like I did. Do NOT go inside, just go right into the doorway. I think I got lucky. I pulled him from where the doorway is, about 10 yards, froze him down, then ran over by the quest item. I killed him there, and no adds showed up til after he was dead and I had looted the item from the chest. He's pretty easy to kill, actually. I went invisible, went over to the other end of the grassy area away from the mobs, and used my Flight Master's Whistle to get outa there. You could just teleport out somewhere too as a mage. I ran right through the mobs and to the ledge behind Tharillon. I had on both Stonehide Leather binding and Leystone Hoofplates. I don't know if they made a difference but probably kept me from being dismounted. Anyway, to my surprise, when I got to the ledge all the mobs turned back except Tharillon. I killed him then grabbed the spade and ported back to Dal. It can be brute-forced with a Beast Mastery pet; attract aggro to the pet, run to the item, use feign death. Revive pet fast, it took me 2 deaths only. I did this quest on my 103 rogue with the help of my 865 druid tank. I cleared each terrace and staircase with the tank, then stealthed and parked it out of the way. Then I logged in on my rogue, took her through that area and parked her in a safe place just short of the next terrace. The rogue was able to loot the box after my tank killed the herbalist and everybody else in the zone. By the way, the mobs cannot see you in stealth when you are 110, but they can see you if you are underlevel. Rogues can do this quest without having to fight him. Just stealth in, sap him and loop the chest. Did it on my level 110 shammy. Ran to the corner where the chest was, pop hero and AOE all mobs down. You can't loot the chest without killing the mob. I took a Goblin Glider from the Obsidian Overlook flight point. Land on the domed roof and jump down between the tree and wall a bit to the right of him. From there, I was able to pull Tharillion and only one other mob, loot the chest and hearth to Dalaran. Does anyone know if you have to have any certain herbalism level to get the spade? I have kited to the cliff twice on my DemonHunter and killed him and the other mobs but couldn't loot the chest. Reporting in 110 Mage, sheeped mob looted box, slowfall off cliff did not need to kill mob. Did this quest as 110 Disc Priest. Went through the main entrance. Hid in the room that spawns friendly voidwalkers on the left. There is a crack between the world right outside the room to the left for you to sneak past the guard and reach the balcony outside. From there, I ran straight to the chest. Popped fear. Looted then jumped off the balcony and levitated down to the river. If you don't wanna run up thru the ruins dragging mobs, you can glide down from highmountain using a goblin glider.. super simple. As some people are saying to just loot the chest and not kill him. Tried that today (4-13-2017) and it was LOCKED. Did a mass entanglement on all the mobs and tried to open the chest and it was a no go. Since I was in Restro for the mass entanglement I had to glider out of there and go back as Feral and kill him to get the chest unlocked. There is NO key but he has to be dead for it to unlock. I didn't try to acquire this quest until after I had unlocked flying. I started looking for it today. (You need to pick Starlight Roses to get it) I flew from Meredil, counterclockwise around the outside edge of Felsoul Hold, then followed the outside edge of the shield around Suramar City. I got the quest when I picked the node at location 39:52. It took about 15 picks to get it. Maybe I was lucky, or maybe there is a certain area that it spawns in. If you get this quest, please post the location here to see if it is spawning randomly across the map, or in a specific area. what if you had this and accidentally dropped it? 106 balance druid, snuck through to the rock area behind the quest dude with prowl, popped a flask and some buff food, aggroed and killed quest dude and an add, prowled to the box, got the thing, dal hearthstone. Died once, but oh well. Did this with a 106 Demon hunter(although could have done it earlier if I'd have the quest item sooner. Not my main char so I have flight. Flew in and hovered over the item. Dismounted at safe height using Metamorphosis, for stun effect on landing. Looted and jumped off the cliff for safe glide down into the ravine, avoiding other mobs on landing. Any safe-fall or glide ability could be used but the AoE stun is what is required, to give looting time. I escaped with about 30% HP remaining as i did take a couple of hits. As of today, 16 Jan 2018 (the day that 7.3.5 dropped), the chest is glaringly marked LOCKED and unlootable until you kill Herbalist Tharillion. Encontre a Lâmina Quebrada do Herborista. Você reparou na inscrição na base do cabo, <name>? Diz "Herborista Tharillon," na escrita dos filhos da noite. O cabo não nos diz muita coisa, mas talvez a lâmina da pá nos dê alguma informação sobre como colher a rosa-da-luz-estelar sem falhar tantas vezes. Eu começaria a procurar em Suramar. A lâmina é encantada... é claro que seria. Tenho certeza de que consigo replicar este encantamento em Dalaran.